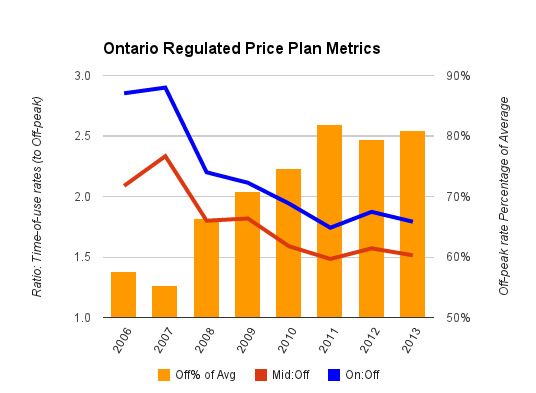 Today the Ontario Energy Board (OEB) announced regulated price plan rates for November 1 2014 - April 30, 2014: my initial review shows the rate hike is over 12% from the same period a year earlier, which is a record hike for winter rates since the OEB started setting rates, and probably also exceeds historical price spikes in the early 1990's, and the 1970's. The OEB posts a number of documents in announcing the rates; Navigant Consulting has been providing a canned report for years, so I was just briefly leafing through it and found a new table displayed this time around - I've marked it up as Ontarians, and many others, have exhibited a lot of difficulty spotting the obvious. Solar is expected to be 11% of the total - and that's in the least productive months for solar output! I have noted solar is likely now exceeded the cost of hydro (I regularly update supply cost estimates here), and Navigant is now showing it too. The OEB's backgrounder accompanying the announcement contains the apparently requisite (if you wish to keep a healthy paycheque) nonsense on time-of-use rates/smart meters. Time-of-use prices are designed to better reflect the cost of power at different times of the day. They encourage consumers to use electricity during lower-cost time periods that in turn can ease pressure on the provincial power system. It can also benefit the environment. Funny that: if solar is to contribute 11% of the cost, during daylight hours, and look to continue being the key driver of rate increases, how is it possible that the highest price hikes are again in off-peak hours? Is that to discourage shifting use? Empathize, if you can, with those few who have spent money on consumption shifting technologies only to have seen the saving opportunities in doing so disappear as they are bombarded with coupons for lightbulbs, new furnaces and really sweat air conditioning promotions. Perhaps picture the same disappearing return of investment happening to solar producers with lucrative feed-in tariff contracts. It is probably long past-time for the OEB to prohibit the recovery of expenditures on conservation at the Ontario Power Authority, zap the funding of a smart data repository inexplicably placed with a market operator, and to review local distribution companies rate requests to eliminate ROE costs based on marking equity up $700 for each stupidly installed ~$150 smart meter. There are a lot of entities involved with Ontario's electricity sector feasting on ratepayers and not even feigning an attempt at providing value in return. This rate increase is going to be very mild compared to what will come next May. The regulator should be the entity to introduce responsibility back into Ontario's electricity sector - or it might be the first target of the entity that eventually does.